Too funny for its own good. Reality shifts again with Pioneer’s domestic release of the Shin Tenchi-Muyo! TV Series. Renamed Tenchi In Tokyo to better diversify itself from the other Tenchi-Muyo! realities, the show is currently available dubbed or subtitled on eight VHS tapes or you can get both versions on eight bilingual DVDs. Tenchi In Tokyo sets up yet another, different, reality in which Tenchi Misaki has been plagued by six girls and a cabbit from outer space. But in this reality Ryoko and her partner Washu (no longer her mother, or even an independent scientist, for that matter) have stolen the power of Jurai. And the royal princesses, Aeka and Sasami, with her pet Ryo-Ohki (who can now transform into a pink mecha), are in hot pursuit of the criminals when Galaxy Police officers Mihoshi and Kiyone appear and bungle things up. You can probably guess what happens next. But I’ll tell you anyway, they all wind up crashing on Earth near Tenchi Misaki. Things go from bad to worse when Ryoko uses the power of Jurai and transforms into a total monster and goes on a rampage. Tenchi uses a crystal, that was his mothers, to put a stop to the battle before it turns tragic. But, the power that was released is too much for Tenchi to handle. But, the crystal served its purpose. The battle is stopped. But, now he’s got an unlikely band of girls stranded on Earth. To try to atone, he breaks the crystal into shards and gives a crystal fragment to each of the girls and offers them a chance to stay with him and his family. They accept. This is just the back-story of the series which isn’t brought into the light until episodes 7 and 8. As the story begins Tenchi has just been given a chance to begin an apprenticeship for the Misaki Shrine Priest/Caretaker in Tokyo. Which also gives him a chance to attend college. However, Tenchi didn't tell any of the girls that he is leaving to Tokyo. In rebellion they devise a portal from the Tenchi house to Tenchi's new apartment. But, when the beautiful, and totally sweet, Sakuya works her way into Tenchi's heart the girls go berserk. Not to mention that the villain Yugi and her three generals show up and all hell breaks loose as an insane series of monsters appear, in Sailor Moon fashion, for the girls to dispel. All these explanations are really doing justice to the horribly weak plot of this TV series. What makes the TV series almost unbearable to watch are the new character designs and the frequent use of super deformed animation to highlight the slapstick actions of the characters. But, the series isn't all that bad. 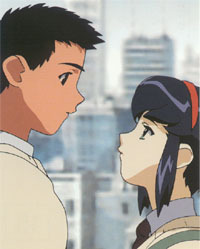 Here are some highlights to look forward to if you do give this series try: Tenchi's first girlfriend, Tenchi's first kiss, Tenchi's date with Ryoko, Tenchi Day, Sasami's essential role to the outcome of the series, and a shocking finale. Each volume comes complete with a postcard of the cover image and the DVD releases come complete with armory cases and few extras aside from the bilingual audio tracks. Tenchi In Tokyo may not be perfect, but it is a decent diversion. You’ll either love it or hate it.